Patrick. Confession. St. Patrick: His Writings and Life, edited and translated by Newport J.D. White, Macmillan, 1920, pp. 31-51. Google Books. Adams, J.N. An Anthology of Informal Latin, 200 BC – AD 900: Fifty Texts with Translations and Linguistic Commentary. Cambridge UP, 2016. Bieler, Ludwig. “The Place of Saint Patrick in Latin Language and Literature.” Vigiliae Christianae, vol. 6, no. 2, Apr. 1952, pp. 65-98. JSTOR, doi:10.2307/1582579. de Paor, Máire B. Patrick: The Pilgrim Apostle of Ireland. Regan Books–HarperCollins, 1998. Gellrich, Jesse M. Discourse and Dominion in the Fourteenth Century: Oral Contexts of Writing, Politics, and Poetry. Princeton UP, 1995. Hood, A.B.E, editor and translator. St. Patrick: His Writings and Muirchu’s Life. Phillimore, 1978. Kelly, David. “St Patrick’s Writings: Confessio and Epistola.” Saint Patrick’s Confessio, Royal Irish Academy, 2011, www.confessio.ie/more/article_kelly#. McCaffrey, Carmel, and Leo Eaton. In Search of Ancient Ireland: The Origins of the Irish, from Neolithic Times to the Coming of the English. New Amsterdam Books, 2002. Olden, Thomas, translator. The Confession of St. Patrick. George Drought, 1853. Google Books. 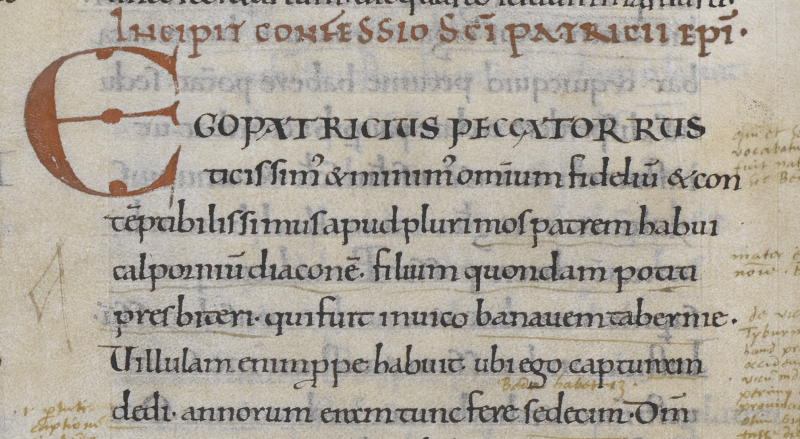 Image: Detail of the opening lines of St. Patrick’s Confessio as preserved in Cotton MS Nero E I/1 f.169v. Patrick, do you have an idea of which translated and annotated version is best ? I have poked around a bit but I am unsure of which to go with. The three I spent the most time with were Olden’s (1853), White (1920), and Hood (1978). Of those, I’d say Hood has the best balance between accuracy and clarity, and as a bonus, the book includes the Latin texts for comparison (though not on facing pages). I used White for copyright reasons; it’s language is a bit more archaic, especially in reproducing the biblical phrases, but on the plus side, he italicizes biblical quotations (even just fragments), which really highlights how much of Patrick’s language is rooted in the phrasings of the early Latin bibles. Olden’s translation I was not wild about, and his very pointed agenda makes it a bit suspect. There’s also a more recent (2003) translation by Pádraig McCarthy freely accessible at https://www.confessio.ie/etexts/confessio_english# which I’ve only skimmed over. It seems fine. For some of the specific sentences I remember looking up, I find I slightly prefer Hood, but McCarthy is certainly easier to get your hands on and has decent footnotes. Hood is rather lacking in notes; White actually has even more comprehensive notes than McCarthy. So if you want a clean read, Hood or McCarthy would probably each be good choices. If you want more elucidation of specific phrases, you might want to have a copy of White on hand (which is fortunately freely available via Google Books: https://books.google.com/books?id=1OZlAAAAMAAJ&dq=newport j.d. white patrick&pg=PP7#v=onepage&q=newport j.d. white patrick&f=false.